Events are like folders. A daughter’s wedding, a birthday party, nature photos, etc. They represent an "event" or category. You can define them vaguely, like "nature" or more specific like "butterfly photos" – the choice is yours. iPhoto Albums are a way to sub-categorize your photos. A regular album is created and you can drag and drop photos from any event into the album. iPhoto Smart Albums are similar to regular albums, but you specify the criteria and iPhoto creates it for you. The content in Smart Albums is dynamic and always changing, based on the changes to your iPhoto library or events. There are three pull down menus, and virtually unlimited possibilities to create content for your Smart Album. 1. To create more conditional statements, click the + button. 2. Give your Smart Album a title. 3. Choose how iPhoto will match the conditions, either any or all of them! 4. Click the OK button when you are done. Once you click OK, you’ll find your new Smart Album under the "Albums" heading on the left side menu, Click on it, and you’ll find it filled with photos matching your criteria. Smart Albums are notated by a little purple "folder" icon. 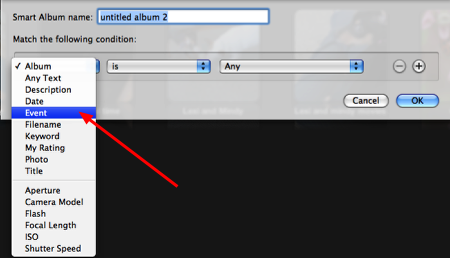 To display photo "count", in Preferences, (iPhoto>Preferences) make sure the "Show Item Counts" check box is selected. You can create multiple Smart Albums to display, categorize and organize your content. If you find that you’re creating Smart Albums using a lot of the same conditions, you may opt to duplicating a Smart Album instead of creating new. 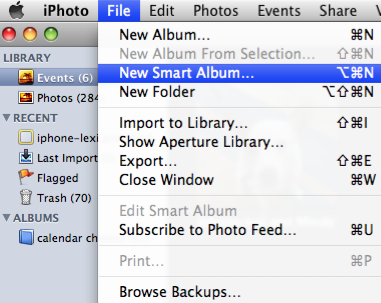 Right-click on the Smart Album, choose "Duplicate." To edit Smart Album conditions, right-click on the Smart Album, and choose "Edit Smart Album" to change the criteria of the album contents. The conditions can be changed at any time. Once you hit OK, the album contents will change to meet your new criteria. Note: iPhoto doesn’t actually move or duplicate your photos. It works dynamically, taking files from the iPhoto library (database), and displaying instances of them. So, if you have 4 Smart Albums and some of the photo content in each one is the same, iPhoto doesn’t duplicate the files, it just displays them multiple times. Cool, huh?